Carbide grinding tank, is also known as cemented carbide grinding tank consists of wolfram carbide and cobalt which is famous for its super high hardness. 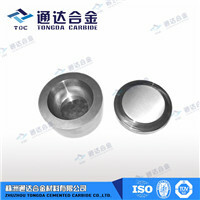 Therefore, the carbide grinding tank, which is made of tungsten carbide material, is of good hardness and abrasion resistance.The powder which is used for planetary ball mill can be in good crushing and do not pollute samples,and can meet the requirements on the hardness, wear resistance and comminuted that the ordinary grinding tank cannot do. As the necessary accessory of the planetary ball mill, during planetary ball mill grinding the powder, carbide grinding tank, which is fill with balls and samples, grinding the balls and materials with the high speed. By the way of friction, impact and shear, the walls of carbide grinding tank will produce intense energy to achieve very good crushing effect. The grinding tank is the container which provides space for completing grinding the powder.